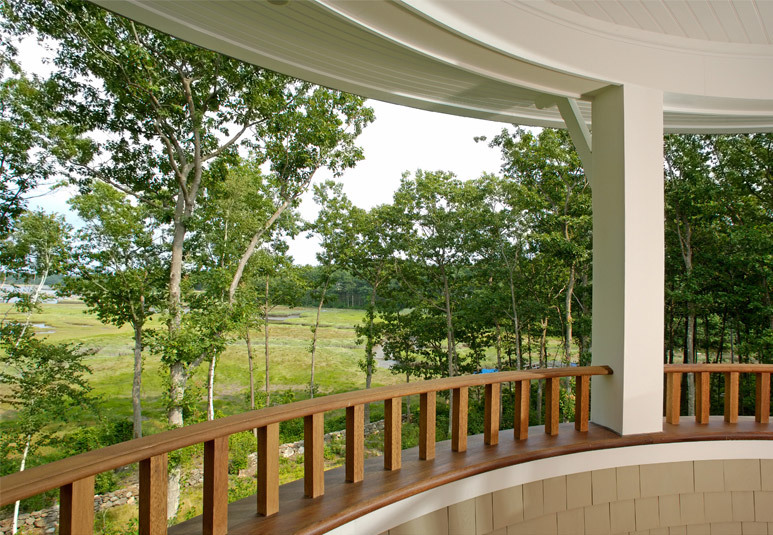 It’s all about the views!” These words became the mantra that guided the design of this four bedroom, 4300 square foot residence which overlooks Witches’ Creek; a tidal estuary and waterway leading directly to the Atlantic Ocean in Portsmouth, New Hampshire. The site was a craggy knoll dotted with large stone outcroppings and a mixture of mature deciduous trees. The house was sited on top of the knoll with all the main living areas facing Witches’ Creek and the ocean view beyond. The waterside elevation is predominantly glass which opens out and steps down to an expansive stone patio for outdoor living. Stone walls surround the patio which helps to define the limits of the exterior patios as well as to meld the house into its natural rocky surroundings. An outdoor fireplace provides warmth and a special ambiance for the owners and their guests. 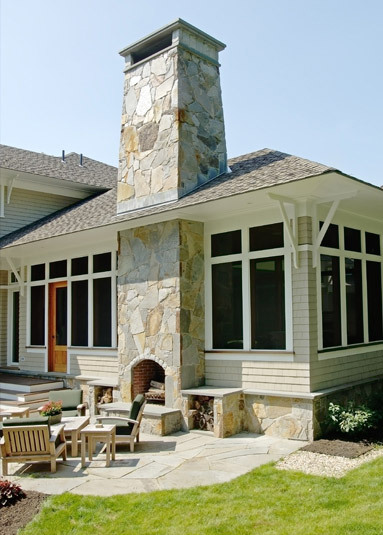 When the weather is too cold or rainy, the owners can retreat to an indoor screened porch with its companion fireplace. 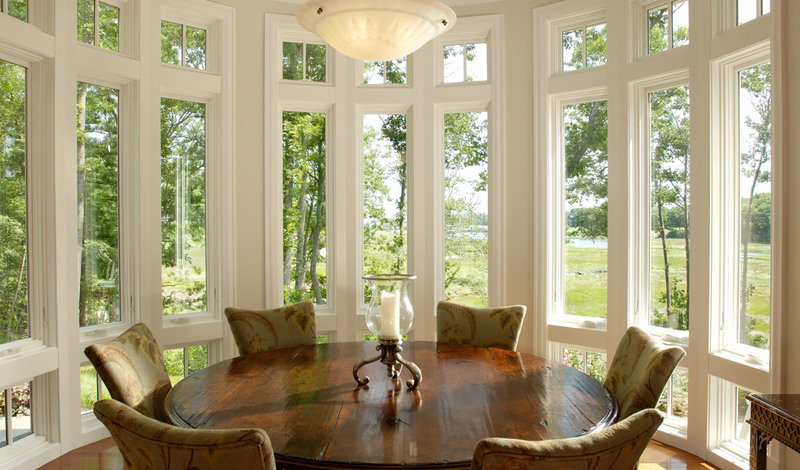 The interior of the home uses an abundance of natural wood which is finely crafted in the nautical tradition of centuries of New England ship builders. 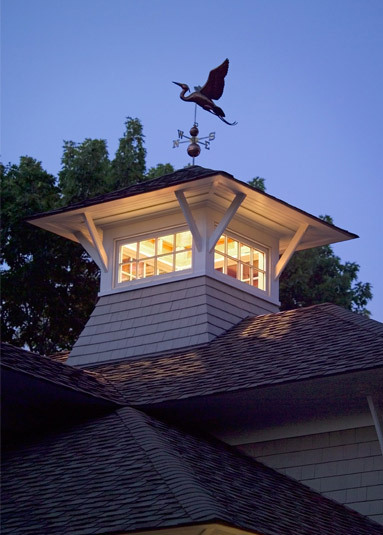 The woodwork in the kitchen, pantry and screen porch all reflect the region’s rich nautical heritage. 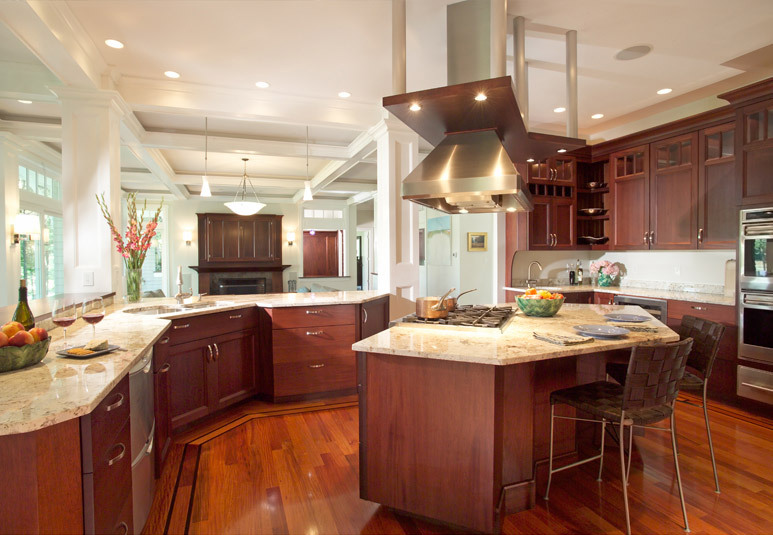 The owner, a former yacht owner, says that the kitchen is his “galley” and acts a daily reminder of his days at sea. 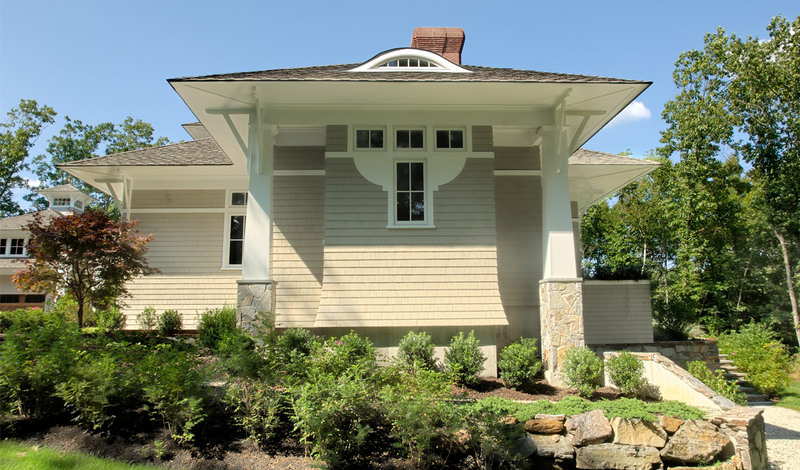 The living room, master bedroom suite, screen porch and dining room all provide sanctuaries in which to watch the tides ebb and flow and observe the changes in the seasons of New England. The front of the home hints of the grand vistas which await those who pass through the entrance into the living room which opens to the panoramic ocean views at the rear of the house. The garage is removed from the main body of the house and treated as a separate structure linked to the house with a glass breezeway. The garage is turned at a 90 degree angle to the house, thus forming an entry courtyard which is accentuated by an entrance arbor, clearly defining the entry point of the house.